This is the fourth album release by this San Francisco based five piece band. They were originally a duo but felt the need to expand their sound on this genuinely unusual roots album that certainly includes blues but is much more a mish mash of styles. There is an occasional gypsy jazz feel, then sometimes they seem to be heading for orchestral territory only to pull back before getting in too deep, then there may be a little ‘world music’ slant or they will even head into hard rock territory and don’t be surprised if you happen across several gorgeous ballads! As you can gather from the preceding this is not a ‘standard’ roots album. Songwriter and vocalist Alexei Wajchman binds everything together with his evocative vocal style that allows the rest of the band to go wherever the mood takes them. There is on occasions a Steely Dan feel but more in terms of David Palmers vocals on the first album ‘Can’t buy a thrill’ although there is often a notable funkiness that again evokes the mighty Dan! If you have a liking for music that has a rootsy feel but is otherwise genuinely uncategorisable I think it’s true to say you will absolutely love this extraordinary recording. Whilst one or two have been slightly less than essential Steve Earle has never made a really bad album in his longish career. There has been everything from country to country rock, bluegrass to rock and much in between but this is his first real blues album. Whilst he has taken 30 years to cover the offshoots of country he successfully manages to do the same with the blues on just this one recording! There is swampy bluesiness, delta blues, blues rock even a little vaudeville and much else, in fact there are really no two songs from the same blues sub genre. His vocals are as usual raw and lived in but still with that dynamic ability to create an atmosphere, the songs are excellent as is the playing. This is another very good album to add to his catalogue, not his best but not one to ignore either. This is Brandi’s best ever album and don’t let anyone tell you it’s not! Her previous albums, at least the ones i’ve heard, all contained some excellent music but this recording is the culmination of the various styles within the roots genre that she has mastery of, which is pretty much all of them, even a little bluesiness. Of course it helps if you can write songs as good as these and possess vocal chords that are capable of whatever emotional depth you demand of them. On this album there are beautiful ballads that will have Emmylou getting a twinge of jealousy and rockers that will have Lucinda turning green with envy. What lifts the album to greater heights is the fact that on several songs there is even a ‘country gothic’ feel that is hauntingly eerie, which when put alongside the ballads, rockers and a little folksiness pretty much completes the package. Add the quality of the arrangements and the playing of her terrific band and what more could you want? Hopefully more albums of this quality! 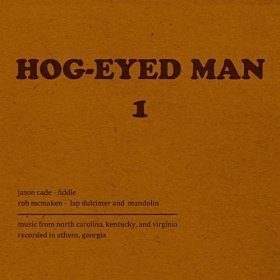 This is a terrific album of North Carolina, Kentucky and Virginia fiddle music played by Jason Cade on fiddle and Rob McMaken on lap dulcimer and mandolin. As you can see by that brief description this is not modern day music but it is most certainly music that is as relevant today as it was a century or more ago. It is actually not only evocative of the old Appalachian mountain music but also conjures up old British Isles folk music from where much of the music was arguably conceived. For anyone learning to play fiddle they will not find a finer quality to aim for, although very few will attain this kind of virtuosity. Really, it should go without saying that these two men have an incredible depth of feeling for this music that I’m guessing parallels the originals for authenticity. I say that I’m guessing because there are very few of these tunes that I am familiar with, which brings me to another important factor with Hog-Eyed Man 1. Were it not for recordings such as this, ‘old timey’ music would perhaps not actually die out but would certainly not be available to the masses, something that would be a huge loss to all but the locale from which the music sprung. Great music, beautifully played and an excellent historical document.